This evening, we’ll celebrate your arrival with a tour orientation and welcome cocktail reception. After a healthy breakfast, insightCuba guests are invited to participate in the MaraCuba 3k race. This race is run simultaneously in each province throughout Cuba. It's great fun as local residents and children join the crowd of runners as you make your way through Old Havana. Walkers are invited. Afterwards, everyone can take part in the post-race parade with music and dancing. InsightCuba will take care of your race check in, and later in the day, we'll distribute running bibs, race information, and other goodies. Afterwards, runners and companions can explore Havana. Our insightCuba marathon concierge team in the hotel is available to suggest activities and answer any questions. Tonight, dine on your own at a paladar, a private, family-owned restaurant. Your insightCuba marathon concierge will make outstanding recommendations. Let the race begin! 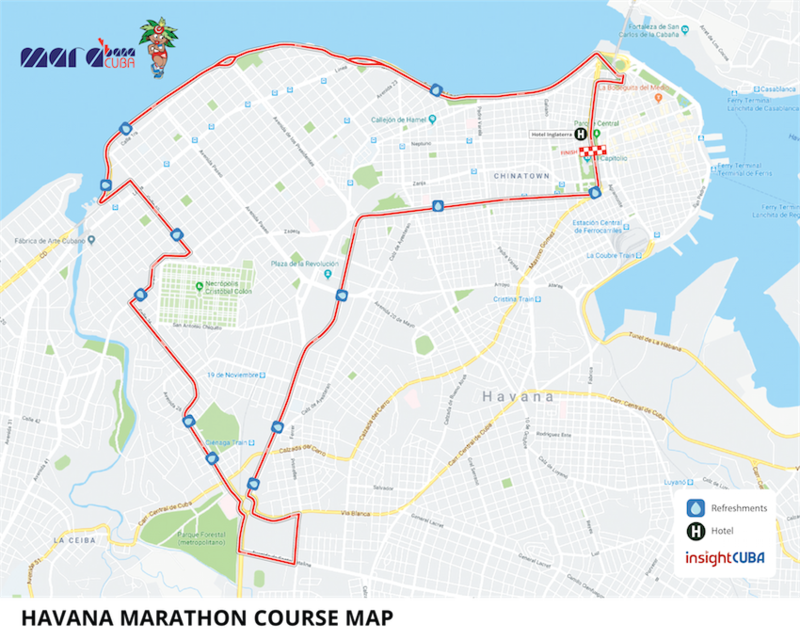 Early this morning after a light breakfast, you'll take a one block walk from the Hotel Inglaterra to the starting line to meet your fellow insightCuba runners for a team photograph. After the race, return to the hotel to freshen up, relax, and enjoy the afternoon, or see the rest of Havana. At tonight’s farewell cocktail reception, celebrate in the company of your Cuban counterparts and new American friends. Check out of your hotel and bid “adiosito” (“goodbye for now”) to Havana. Travel to the airport for your return flight to the U.S. Please note that this itinerary is subject to change. Due to the unique nature of our programming, each departure is custom designed and not every activity listed on this itinerary is always available. Three nights at the Hotel Inglaterra in Old Havana, next to the starting line of the race. Not included: Airfare, gratuities, and airport transfers. Guests will transfer to and from the airport by taxi. Once you have booked your tour, our flight concierge will gladly assist you with all your flight needs. Call us at 914-380-8303 or click here for an air quote. Please note that airport transfers are not included. Taking a taxi from the airport to the hotel is very simple and will cost only CUC$25 (US$30) each way.